If your Facebook friend suddenly debuts an especially patriotic avatar this week, it might not be because they’re extra excited about the 4th of July. 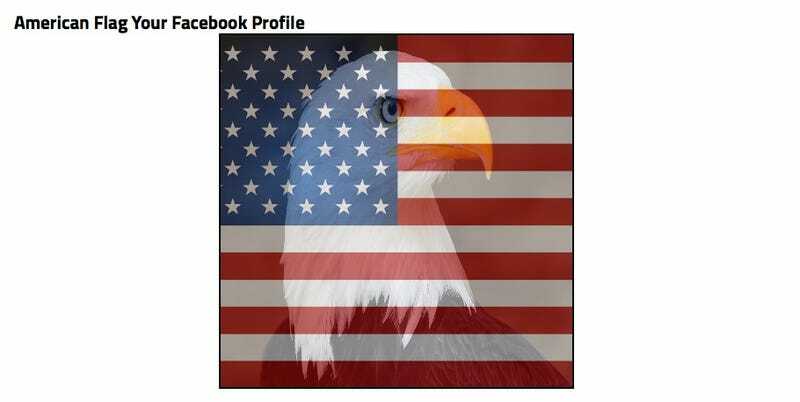 To combat all that gay in their timelines, some conservatives are calling for true Americans cover their profile photos with American flags instead. The American flag as a symbol of anti-gay marriage sentiment is just sad. First of all, it’s not really the opposite of a rainbow flag, it’s more just, like, pro-US. It’s especially misguided because so many people will be wearing and/or waving American flags this weekend—maybe even more than usual to celebrate a very good week for the country. Update: There are some other American flag profile generators (here and here) which claim they are purely patriotic in their intentions (at least, they might be?). Which makes it even more awful that some are trying to convince others to use the American flag imagery as an anti-rainbow symbol when some people might actually want to show how proud they are to be Americans. Oh, and there’s also a Russian flag generator which is supposedly not anti-gay but some have decided to use it that way, just because it’s not rainbow. Again, it’s a shame that people who actually want to show their support for the country—especially this week!—have to worry about this kind of thing.